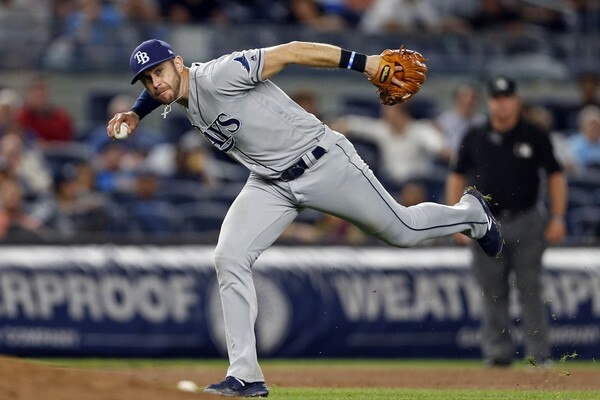 Notorious Yankee-killer Evan Longoria gets shipped to San Francisco, a long ways away. Happy to see him gone from the AL East, but, as the saying goes, I’d grown accustomed to his face. He was a worthy adversary, and will be missed in a weird way. Of course, you all know the Yanks re-signed C.C. to a one-year, $10 million deal and that sounds about right. They also shipped away Chase Headley to save some dough and that sounds about right too. But I am also sorry to see him go because that Chase Headley’s a good egg. Last summer, I spent a couple of days at the Stadium on assignment for Esquire poking around about Aaron Judge. I spoke to Judge, briefly, and to a few of his teammates: C.C. was standoffish, Didi was terse and odd, Aaron Hicks, then on the DL, was interesting and Brett Gardner was generous and helpful, and I’ll tell you this—Chase Headley was just such a good guy. No airs, no pretense, professional, but thoughtful, just a good guy. Gave me a lot of time, had some great observations. I’d never been his biggest fan just watching him but after meeting him I had no choice but to root for him for the rest of his career. Wish him luck. Loved hearing your comments on the players, Alex. That stuff is priceless. Most of us never get to meet the players, so we have to imagine what they might be like in person. If we do meet them it's an awkward situation in an airport, street corner or autograph signing. I went up to C.C. and just by the look in his eye I could tell he wasn't into it. He answered a few questions and then I just begged off. Judge told me nothing but was extremely polite and cordial. Good manners. Looked me in the eye. Remembered my name—minor detail but not necessarily common. Gardner was just a good old guy, easy. But Headley seemed like a guy, a regular guy, not a professional jock. The Yankees have a reputation as an easy clubhouse to work for the media. The guys are relatively accessible. They don’t say much in terms of candor but they are there for you. The Yanks PR department is solid. For writers, the Mets are better because their PR stuff is so loose that you occasionally get guys who have loose lips. Bad for the team perhaps—Matt Harvey—but more interesting for a reporter looking for a quote or something a little more spontaneous. Reminds me very much of my impression of Scott Brosius, both from afar and during a few in-person interactions when I worked some stories for Yankees Magazine. Thank you, Alex. I'm sure most folks remember when Eva Longoria was a name and Evan was unknown. When he was coming up from the minors, some color commentator thought his name was a joke. Hope he rakes in SF. Oh, and speaking of Yankee killers, we should tip the cap to the late Frank Lary who passed away about 10 days ago. rumor. .. Gerrit Cole for Frazier. not sure if anybody is looking here, but wishing everyone a happy and healthy new year. So damn cold here the dogs don’t last five minutes outside.